Atlanta Flooring Centre now carries three beautiful lines of Kitchen cabinets from Merit, Lectus, and Euro Rite. Our professional in-house kitchen & bath designer is here to help you with any project of any size. Our installation crews are qualified and experienced with new builds, insurance claims, and complete renovation projects. Your plans can become a reality with Atlanta! The stunning showroom of Atlanta Flooring includes a wide variety of cabinet, countertop, and hardware selections to suit every style. 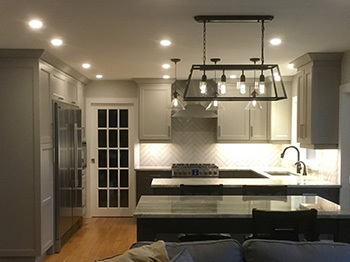 With our 3D drafting program, we can show you what your space will look like including all finishes (backsplash tile, paint colours, hardware). Our in house interior designer, Bryden, is excited to assist you with designing a fresh new look for all of your cabinetry needs. He will visit your site to ensure accurate measurements, ensure that your design fits your style and budget, and turn your plans into a professional 3D visualization. Bryden will also assist you throughout the selection process for countertops and hardware accents. 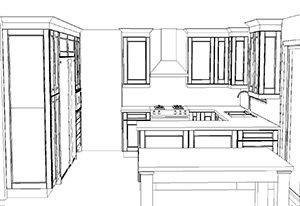 Along with the 20/20 3D visualization you will receive a competitive quote for your cabinetry and installation.